A funeral for Lucky the goldfish. 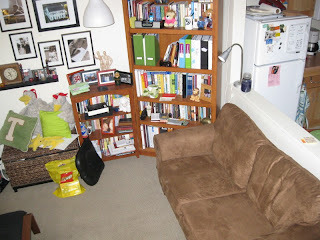 Anyway, I decided that one of things I wanted to do this summer was get a little couch. I searched around, looked at IKEA (they have a cute one, but to get a nice cover it increases the price by almost $200! ), looked at a hotel outlet store, looked online. 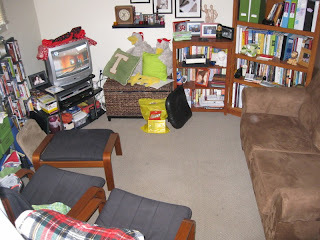 I measured all these different couches and tried to decide how much I could spend.... as my friend Candice will tell you, making the decision was hard to say the least! Well, I found one that I thought was a good price and a good size. I went into Caprice Furniture in Culver City (after looking at their website online), and ordered it! It arrived a week later and they delivered it today! Here are the pics! 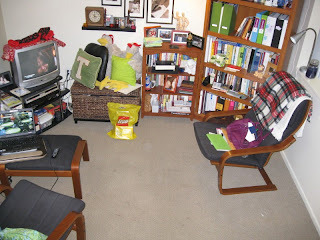 Sort of "Before" - I had already moved the furniture to make space for the couch, but you get the idea. After! With a nice little comfy couch and two other seats! I think I could fit four people in the apt now! Yay! A better look at the couch. I love it! In February my friends, John and Karen, had their fifth baby, a little girl named Brooklin Dorothy. Brookie has a strong will and knows what she wants - and she has a smile that will make you want to give her anything. Well, for a long time she was not gaining weight as she should, her eating was not great, and she wasn't sleeping well. There were even a few crises in the first number of months. The Lord has continued to be faithful and give the family help and peace, and actually, when I was in Texas, Brooklin was doing a little better. She is so small that we call her "Pixie" - because she just looks like a little fairy or pixie, with her tininess and her full head of dark hair that sort of frames her face and ears. 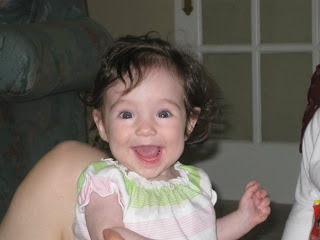 Here is a picture from when she was about 5 months old. I recently picked up some gifts for the oldest 4 of the Ferg kids. There wasn't a toy at that store that was appropriate for an infant, so I was just not getting Brook a gift. Until I was at JoAnn's the other day and saw this adorable little quilt project. It had all the fabric and the directions -I just needed to cut, sew, and quilt. AND.... it had pixies on it - for real!! I thought it was the most adorable pattern with really sweet colors (see pixies below). 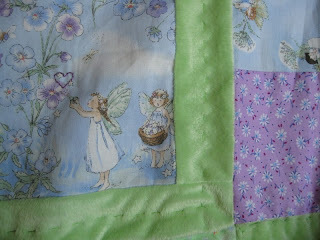 As I cut the fabric, stitched it together and as I started the quilting, I was thinking about Brooklin and her family. And I found myself praying for her as I sewed. Below is the (almost) finished product. Its just a really lightweight blanket (no batting in between) that can work as a blankie or whatever. But, I loved that as I worked on it the Lord continued to allow it to be a time of worship and prayer for me. I am hoping that I can continue to do craft- and artwork as gifts to people that I can also use as a prayer tool, and then as a blessing in my giving it to them. I'm again thankful for the Lord's reminder that He is in these moments of creativity and work. After eating a delicious lunch, we headed into the store to look around. I had been wanting to start Andi Fergason on a new craft and so was looking for something she and I might enjoy. I found these cute, small cross-stitch projects - and I got her one of a little butterfly. I also saw this great "Names of God" sampler for me to work on. I have loved doing cross-stitch over the years, but have not done much of it in the last few. What I found in this case was that as I was stitching the different names of God, as I looked at the pattern and changed the colors or little bits of the fonts, etc., I found myself worshipping. As I stitched "Name Above All Names," I could hear the song "Jesus, Name above all names" running through my head. As I stitched "The Way," I thought about the verses in scripture where Jesus says he is the way, the truth, and the life. It was almost as though each stitch was a prayer. I was pleased with how it turned out, and I'll look forward to framing it and putting it up somewhere. And I'm excited that I have a TON of embroidery floss left over and can just buy some more aida cloth and make it as a gift. Ultimately, the project reminded me that the Lord wants to use the works of our hands to bring glory to Him, and that I can worship through art and creativity. I feel a little bit like Eric Liddel who said, "When I run, I feel God's pleasure" - when I do crafts and artwork, I feel God's pleasure. I'm glad for the reminder. In the next post, you'll see what I did, most recently, with that reminder! Sunday was a fantastic day! I loved church - I attended the 9:01 service, worked with Growing Kids, and then the 11 o'clock service. The band had a bluegrass flair today and even played one of my favorite Crowder Band songs: "I Saw the Light." What a great start to the morning! After church, I headed up to Porter Ranch to the Joann Fabrics Superstore to pick up some crafting supplies for a few things I am in the mood of making. Since school starts one month from today, and since 2 of those four intervening weeks are filled with people visiting, I figured I'd better get some crafting done! Waaaaaay back in December/January, my parents hosted a Christmas party at their house. Each of the four of us (my parents, brother, and I) all invited guests to attend. I had planned to make these really cute cocktail aprons for us to wear - but since we also planned to make about a million different types of appetizers, I just ran out of time. Well, I pinned the aprons a few weeks ago, and FINALLY yesterday got them all sewed together and I have to be honest...... THEY ARE ADORABLE!! See picture! 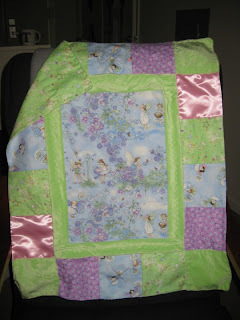 I am also working on a gift for my friends' baby, Brooklyn - so no picture yet - its not quite finished. AND working on making some coffee cozies, too. My friend Kristen made one for me for my birthday and I thought it was a really fun gift! So I figured I'd try my hand at making a couple. Finally (and unrelated to yesterday), I had been working on a cross stitch sampler this summer. I finished it a few weeks ago, but haven't had time to post a picture - one will come soon! When I lived in Seattle, I attended United Evangelical Free Church (as some of you know, of course). Its a little church in Ballard, and at the time some close friends of mine (the Fergasons) were attending. I ended up becoming a member there (my first - and until later this year, only, officially church membership), and though I had come to faith in Jesus years earlier, I was baptized as a profession of faith there. While at United, I joined the Fergasons in youth ministry and worked with the Jr. High and High School students. Casey Chapman was in Jr. High when I started working with the youth, and finishing her sophomore year of high school when I left for Illinois. Her dad was our senior pastor, Todd (he baptized me), and her parents together were lovers of God who allowed their children to seek faith on their own, engaged them in real conversations about Christ, and loved them fully. 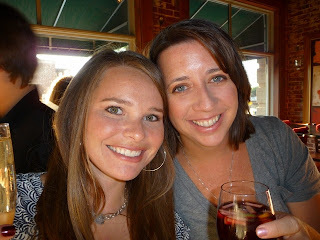 Casey was one of my favorites - she is authentic, fun, and funny, and has a zest for life and an inquisitive mind. Well, that is a long introduction to these photos -and to tell you that on Friday I was honored and privileged to attend Casey's wedding!! I can barely even believe that this young woman, who I've known since she was a young teenager, is now someone's wife. She has matured into a woman of grace and character. Both Casey's and David's fathers are pastors - and so the wedding ceremony was performed by both of them. And Casey's mom served as a bridesmaid, which I thought was especially sweet. Lots of happy and melancholy tears were shed. It was a great end to one season of life, and beginning of another. Here are some photos! While at the wedding, I happened to sit down in the same row as some old friends from United. I was pleased to see people I knew, and to get caught up with them. What a pleasant treat! Since returning from St. Louis, it is like the Lord has flipped a switch on my social life. I had been telling Matt that the second year is always better than the first (in terms of feeling like you "fit" somewhere, deepening relationships, etc) and that is proving true again for me here - like it had when I moved to Greenville and Waco before. My friend Dave's girlfriend, Jenn, moved to the LA area and it has been really fun to hang out with them and get to know her better. I knew I liked her the first time we met, and that feeling is confirmed each time we meet again! I've also been trying to be more involved at my church, Bel Air Pres, and have been attending the young adults deal: the Foundry. Most recently, I visited Sprinkles in Beverly Hills with a few friends - one of whom was moving to San Diego (sadly, we had just started to become friends as she was moving away! ); and saw my first show at the Hollywood Bowl with my friend Marcela! (she got us free tickets to an awesome performance of Tchaikovsky) OH, and some friends and I saw "My Fair Lady" for free at Century City Mall - they have free movies on Wednesdays. We forgot to take pics at that event, but perhaps at future movies we'll remember. Last but not least, the first weekend after getting back from St. Louis, I headed to Phoenix to spend a weekend with my family before my dad went back to school. I hadn't seen them in a few months and I missed them a LOT. We had a really great time together. That same weekend, the Phoenix Breakfast Club was called to order and we joined up at our "usual" (formerly, until Pam got food poisoning) location to get caught up. I love having the chance to catch up with these Greenville friends. All in all, the trip home was at least one day too short - I wished I could have stayed longer. All in all..... a good summer. No friends, I'm not asking YOU that question, but I have heard that question a lot from various people! Most often the answer is "in the cave", which is what I call the office in which I work. But occasionally my answer is "out of town!" Here is a recap of my trip to St. Louis! Earlier this summer, after getting back from Waco, my friend Candice said, "Tiff - what if we all got together one last time in St. Louis before Collin and I leave for England?" I said, "Yes." and then the Lord stepped in and provided a time that worked for all of us (Candice, Collin, Matt and I) AND lowered ticket prices overnight after I prayed about it. It was pretty sweet. The Bullards arrived around midnight and it was a great reunion - despite the lateness of the evening! Thursday, Matt had to work during the day, but the Bullards and I enjoyed hanging out, getting caught up, working on our own things (I had some work to do), and talking about what life will be like when they move to England. Once Matt was done with work, we loaded up into the car, picked up our friend Brittney, and met up with Maura and Marcus Burzota in Forest park. We ate together and got caught up before heading into the Muny to see Camelot. I had told my friends that the one thing I wanted to do while I was in St.L was go to the Muny and if we did it, I would do anything they wanted. So I was glad to get to see a musical, at the Muny and it was fun... but we all agree: Camelot = downer, big time. Friday, Matt had to work again (getting prepped for RA training) but Candice and I did NOT, so we met up with Britt, and headed to her nail place for Manis and Pedis. It was a great way to start our vacation weekend!! After lunch at Brittney's favorite Creperie (collin joined us), we grabbed Matt and headed for a nice long walk in Forest Park. I tell you people - living right next door to Forest Park is awesome - as I walk around Westwood and UCLA, I miss the parks that I used to live near in Seattle and Illinois. Forest Park is great. Friday night we went to a great dinner place that had little "bites" - our favorite: Bacon-wrapped dates with blue cheese - delicious. Then the four of us met up with Brittney at the Arch waterfront for the tail end of a Guster concert and a really great fireworks show. Afterward, we headed to Failoni's, a really great tiny little bar that Matt and his friends go to sometimes. The owners SING (!!!) live music, karaoke style - I can't even put into words how fun it is. You should go there if you are ever in StL. Saturday, we lounged around all morning, which was perfect and totally filled my heart with joy. I love hanging with those three and it was fun to just be there together. It was raining outside and we ended up staying in Matt's apartment virtually the entire day. We played Guitar Hero, made some great food, and eventually met up with Matt's coworkers at the Schlafly Brewery. Sunday, the weather was nice again and we headed out with Brittney to the St. Louis Botanical Gardens. What a delightful time. The weather was perfect, the company was good, and I love the beauty of nature there. That night the four of us ended up making dinner again, and just hanging out together at Matt's apartment. It was our last night together for a while, and so we soaked it up with good conversation, lots of laughter and a late night trip to Ted Drewe's for Frozen Custard. I had to leave on Monday afternoon/evening. Matt worked in the morning. I packed and we all went to lunch together and then later they took me to the airport. It was a bittersweet time. We had a GREAT GREAT GREAT time together, and are hoping to recreate our fun in England next summer with a visit to the Bullards in Cambridge. But it was also sad, knowing that it might be almost a year before we see each other (together) again. For those who want more pics.... here is a slide show from the St. Louis trip and from some early August fun times. Today marks one year since my grampa left us to be with the Lord. And it marks one day since one of my dear friends lost her grandmother. Many of my friends have suffered losses in the days between of siblings, parents, grandparents, and children. That seems to be the story of this year - I don't think that I am more in tune to loss than I was before - I think that perhaps it is because my friends and I are of the ages now where our grandparents and parents are much older and part of life is loss. But what I do know is that there has been a lot of loss this year. I also know that my own experience of loss has dramatically supplemented the grief counseling learning and experiences that I've had over the years. My experience has helped me to become more of a crier over the sad things in my own lives and others. It has given me more compassion and grace for friends who experience loss. And I think that it has given me new perspectives on God and his nature. The Lord has been my constant companion these last 12 months; though I often felt abandoned. Again, and again, though he has met me with verses from his word (through my daily reading or the "daily light"), with thoughts from saints I've never met (henri nouwen is a new favorite), and with comfort from saints who are new and old to me (you, friends, have brought God's blessings to me innumerable times). Just this morning in fact, I read in the Daily Light: "Sing, O heavens! Be Joyful, O earth! And break out in singing, O mountains! For the LORD has comforted his people, and will have mercy on His afflicted." (Is 49:13) I mean, seriously, friends, could there be any better verse for me to wake up to this morning?! Especially since I have KNOWN this comfort and mercy in my life over the last 365 days! Awesome. Today, I had good news from my grama. She has persevered this last year, trying to make a life on her own in Lake Havasu city. It has been a long year for all of us, worrying about her - but it has been an even longer year for her, after losing the love of her life, her best friend and companion. But she survived and in some ways she thrived. I am immensely proud of how she has made it through. All along we encouraged her that she didn't have to work anymore, but I think that she wanted to work - first to keep herself busy, and second because she didn't even have a different plan - she and grampa never really talked about what the other would do if one of them passed away. Well, today its official: She is moving back to Washington state in the spring - officially retiring after one more winter in Lake Havasu City. This is exciting news for all for all of us - she will be living in her trailer but on the property of her daughter (my aunt) Becky, and will be able to be a better part of community there than she is now. So that's it. I read through the posts of the last year related to grampa, and it made me a little sad, but overall, I have felt OK today. Peaceful. I'm grateful for the experiences of the last year - grateful for the difficulties that I've experienced and for living through loss; grateful for the loneliness that I've felt, which bonded me closer to grama as she experienced loneliness; and grateful for the chance to be with my friends as they experience loss. I know that sad times will come again, and I'm sad that grampa's voice is fainter now in my memory than it was after one month, but I also know that I have much to be joyful about. I've posted the links to previous posts below. Thank you to all of you for your friendship and care for me. Peace as you travel your own roads today and in the upcoming days and years.